Even during college, when I was all grown up and could take care of myself, my parents doted on me by serving up my favorite dishes. That hospitality was naturally extended to Evan when he would join our family on the weekends. The hospitality hasn’t abated. In fact, my Mom and Dad have taken great care to nurture us and the kids with the most amazing treats week in and week out. Having arrived home from our recent trip we were welcomed by the not-too-unexpected sight of a fully stocked fridge. Such incredible generosity (and I don’t mean in terms of the cost of ingredients) has inspired me to want to give back, to somehow show that we are grateful. Inspiration hit me this Sunday to make a pie crust. Between trying to savor my latest read and waiting for new yarn for a knitting project, I had a few minutes to myself. Why a pie crust? I make it from scratch with my hands and working butter into flour is tough on your joins. My mom suffers from arthritis, has mentioned several times how much she loves my home-made pie crust, and my dad loves anything dessert. 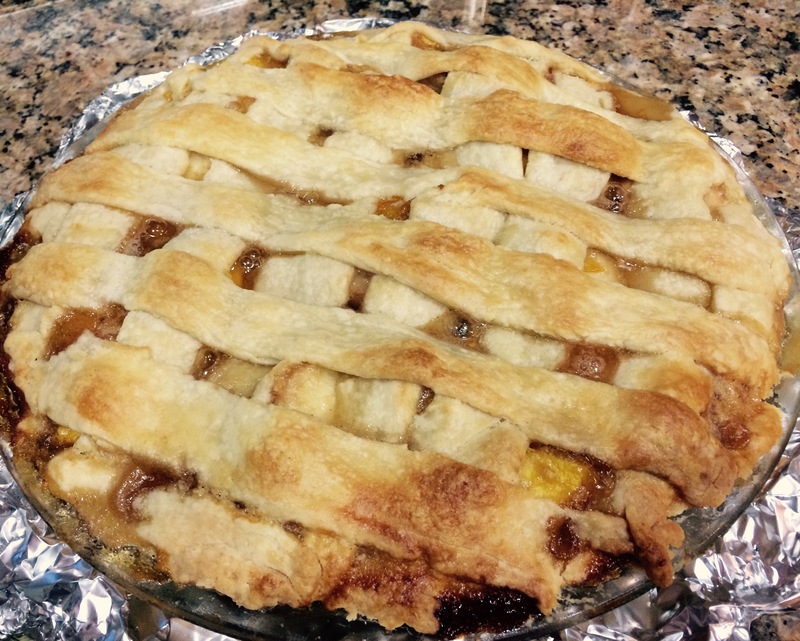 Pie is really a synch to make once you have the crust and the late-harvest peaches make the perfect filling. I wanted to, in my own way, show my gratitude for being so lucky to be doted on.